Everyone was discreet enough not to mention it. 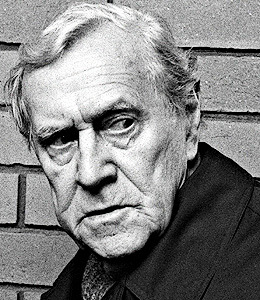 It was, after all, the late Australian Nobel Prize-winning author Patrick White’s 100th birthday. 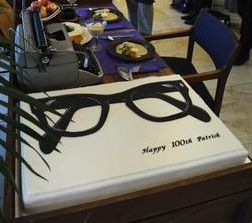 And it was being celebrated in the august surrounds of the National Library of Australia, in Canberra. But if the notoriously curmudgeonly writer had been around, he’d have been outraged. 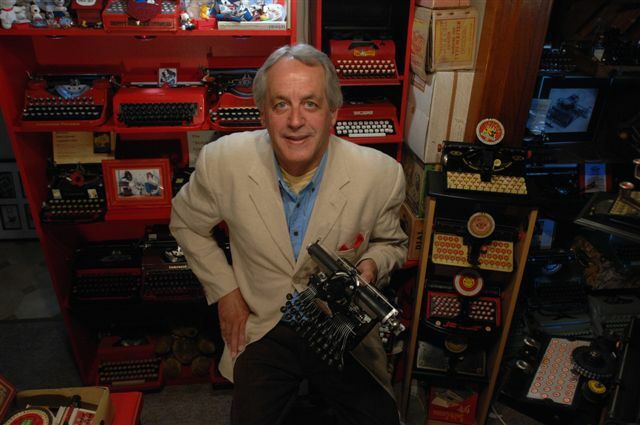 After all, given it was there, people might quite reasonably have assumed it was a Patrick White typewriter! 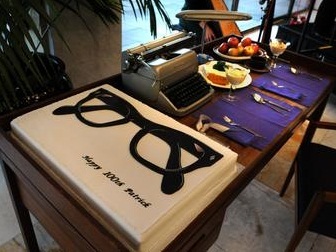 There, on a mock-up of White’s writing desk, beside a large 100th birthday cake decorated with a pair of black-rimmed spectacles, was a Remington Super-Riter office typewriter, the so-called “Superman” typewriter. White, of course, never used such a thing. The typewriter he did use late in life, a Czechoslovakian-made Optima portable, is already ensconced in a Patrick White exhibition at the National Library. 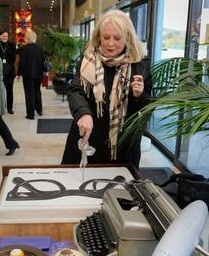 OK, fair enough, whoever put the birthday cake display together had to find another typewriter. But a British-made machine called a Super-Riter? I think not. Not appropriate at all. 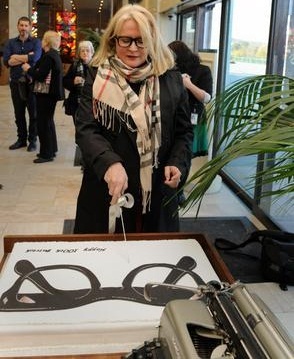 Cutting the cake and recalling her friendship with White, Australian actor Kate Fitzpatrick underlined White’s dislike of all things British, from the monarchy down. He may have been London-born, but he hated with a passion Britain’s lingering influence on things Australian, the so-called "cultural cringe". I feel sure White would have taken a certain pride in owning a typewriter made behind the Iron Curtain, one bearing an East German brand name and made in a Communist worker’s factory. Yes, the Remington sitting on the desk yesterday was made in Glasgow, where workers, led by Manchester United soccer club manager Sir Alex Ferguson, were on occasion rather bolshie. But still it’s a British-made typewriter, and White would not have been amused by such a thing. He was, after all, staunchly republican. Fitzpatrick recounted how she had briefly fallen out with White, who had turned down a knighthood, because she had accepted a Queen’s Silver Jubilee Medal in 1977. When Fitzpatrick attended a regal function given by the English Queen on the royal yacht Britannia, White barred her from appearing in a play White had written for Fitzpatrick, Big Toys. 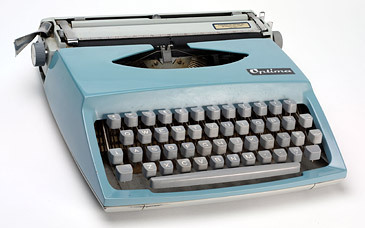 The typewriter White did use, the eggshell blue Optima portable, is on display in the Life of Patrick White exhibition at the National Library, on loan from the New South Wales State Library in Sydney. 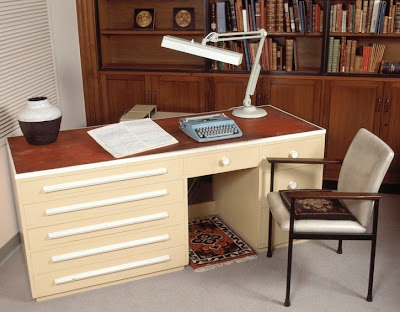 There, the numbskull curators think it is an Olivetti, and continue to proudly say so on the library’s website. 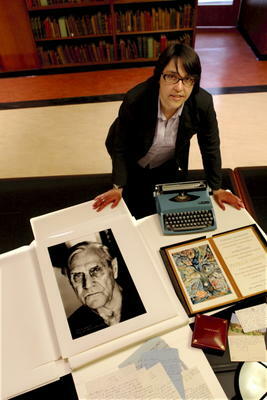 Here we see Tracy Bradford, the library’s head of manuscripts, with White letters, the Optima and a portrait. These photos were taken in late August 2010, but the library first displayed the items in April 2003. Twenty years ago, just after White died and the library had acquired White’s desk and typewriter, senior curator Paul Brunton, who knew the portable was an Optima, worked out the secret behind one of White's characteristic scams. At his home in Centennial Park, Sydney, in the winter of 1988, the then 76-year-old White perpetrated what Brunton called "one of the greatest literary hoaxes of all time", a wicked practical joke at the expense of people he had little time for: academics, librarians, scholars and critics. 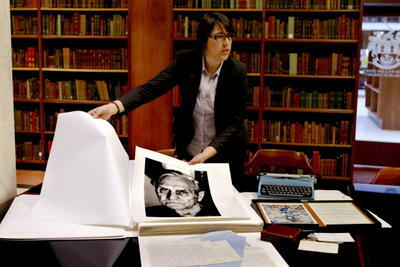 It involved White’s final novel, the manuscript of which the library had combined with the National Library to secure. 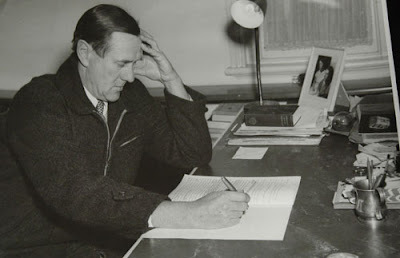 Brunton (seen above, with the Optima) was convinced the truculent, quarrelsome and dry-witted White went to his deathbed thumbing his nose at the literary establishment. 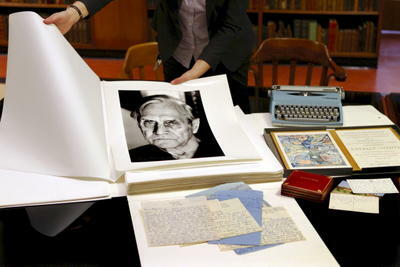 White detested the idea of scholars studying his rough manuscripts, believing the published work was all that counted. He famously destroyed almost all of his manuscripts. One example which survives is a hand-written draft of Memoirs of Many In One. Why was this one spared? 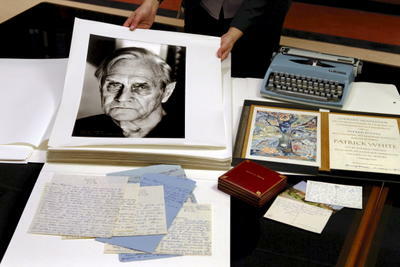 In 1986, a few months after it was published, White was asked by the Canon Collins Trust in London, an anti-apartheid group, to join famous authors donating original manuscripts for auction, to raise money for disadvantaged South Africans. In August 1988 White wrote that he had “found this practically unintelligible MS of Memoirs of Many In One published in 1986. Perhaps its messy condition will make it more appealing to the ferrets." The manuscript was auctioned in London after White's death in 1990. Brunton found it surprisingly orderly. The main draft was in the same blue pen, with relatively few crossings out and no discernible change of hand pressure - as if it had been copied, rather than written afresh. But all the revisions were neatly added in red biro. 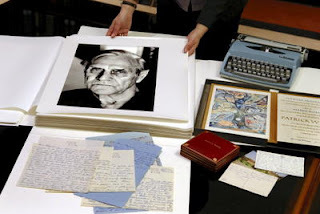 "It is unlike any other author's manuscript I have ever seen," said Brunton. "It's a constructed artifice. When I began to look at the changes I began to see the in-jokes. Then I put it together with the subject of the novel, which purports to be an edited manuscript about the value of archives as opposed to the value of memory." Brunton believed the deception appealed to White’s mischievous sense of humour while raising funds for a cause to which he was sympathetic. But, more importantly, it would set scholarly "ferrets" off on a wild literary goose chase. It would also keep his principles intact, since the false manuscript would reveal "absolutely nothing about his creative process". It should be noted that White didn’t type the final draft. His back had collapsed again, so instead of his usual method of rewriting, his friend and agent Barbara Mobbs typed the second draft for him and then White revised it in its typed version. He dedicated the book to Mobbs (below) and sent it to London in June 1985. Last year it was revealed that an incomplete novel by White would be published to mark the centenary of his birth. The Hanging Garden was left among a pile of papers he instructed were to be destroyed on his death. 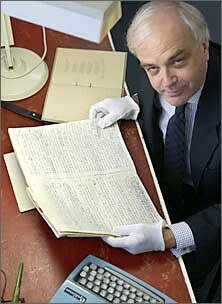 Mobbs, as his literary executor, kept the hand-written manuscript, which is now held in the National Library. It was transcribed in 2010 and has now been typeset. Patrick Victor Martindale White was born on May 28, 1912, in Knightsbridge, London, and died in Sydney on September 30, 1990, aged 78. He won the Nobel Prize in 1973. I can't help but feel that this literary swipe could have been more orchestrated, rather than ill-considered. At the least, someone just grabbed the oldest most outstanding typewriter they could find... for a prop. But surely if you have such a passion to go out and do such a thing, you'd have known the writer's history. I'm wondering if it was an intentional nudge back at the now deceased writer. "Here sir, we have a British made machine for you to type out your next 'manuscript' on. Feel free". Well said, Scott, my sentiments exactly. One of the great disadvantages of the digital age is that we won't have these manuscript drafts of literary works with which to investigate the creative process and the process of revising. Everyone just re-edits their original file. Nothing is left behind. He sounds interesting, I will have to look him up at the library. My current favorite author is Terry Pratchett and he's the same way, leaving no trace of his process, only the published work. I, on the other hand, have nothing but drafts to show for my efforts. Peter, be warned, many people find him exceedingly boring; please don't blame me if you join them. Pratchett also wrote much on a typewriter. LOL Robert. I subscribe to librarian Nancy Pearl's advice: Start with 100 and subtract your age - that's how many pages you have to read before you bail on a book you aren't enjoying. You do indeed, Georg. As previously mentioned on this blog, White's Optima is a rebranded Consul. Czechoslovakia does get a mention here.